Shop Petite Shoes or Large Size Heels with Top Rated Shoes FAQ! We have a live chat agent available most hours of the day! Simply type in our chat box and someone should get back to you shortly. You may also email us at info@topratedshoes.com, and we will respond within 24 hours! Yes! All of our heels are offered in HALF SIZES. Please input it in the “Notes” Section upon checkout , along with your foot measurements if possible. How do I know if my shoe will fit? If you are a first time customer, please ensure to measure your feet! You may read our “How to Measure your Feet” page for instructions if needed. Our Size 3’s and 2’s have approximate measurements in the PRODUCT DESCRIPTION. Please review the details carefully to ensure proper fitting. Our general shopping selection includes an approximate size chart at the bottom. Take note that these run half a size larger than Nordstrom. This gives approximate measurements for the size that you need! Please take the time to review ALL measurements under each product carefully. If you need assistance regarding your size or fit, you may email us at info@topratedshoes.com or talk to our live chat assistant for help. We encourage all new customers to measure their feet and let us know through the “notes” section upon checkout. You may measure in inches or centimeters. Are your shoes listed in ADULTS sizes? This is actually a very common question! All of our heels on our website are listed in ADULT sizing. Women’s adult sizes run larger than children’s sizes. For example, if you wear a kid’s size 1, you are an adult’s size 2.5. You will on average be a size and a half larger. For clarification, talk to our live chat agent! Yes we do! We offer free shipping on all of our products, so please buy as much as you would like. My item has not arrived! 2. Parcels going to the UNITED STATES will be shipped using e-packet, and should arrive within 2 weeks via USPS. Because we are shipping from overseas, the shipping time may be over 15 days~for countries outside of the United States. Please be patient with us as we do try to ship out your package within 2-3 business days of receiving the order. If you do not receive the package within 24 business days, please let us know and we will try to track it down or resend a parcel. Parcels received in CANADA will be shipped using e-packet, and will arrive within 2 weeks via CANADA POST. International orders may take up to 20 days to arrive! Please inquire with us prior to ordering if you require expedited shipping services. 3. We have tracking option available upon check out. Our heels are designed by North American Designers, then manufactured in China. We are sorry to hear that you are dissatisfied with our product! Please email us at returns@topratedshoes.com and we will email you a slip for a return/exchange. Due to our limited free shipping promotion, you will be responsible for return postage (tracking is mandatory due to the lost orders coming back to our warehouse). Please refer to our document here for more information on product returns! A product order confirmation is sent to your email address once the order is placed. This email will include the total amount paid as well as product description. If you did not receive an order confirmation, please check your spam folder. If you may have input an incorrect email address, please email us at info@topratedeshoes.com and we will get back to you within 24 hours. Do you have an affiliates program? We are glad you asked! Please email us at affiliates@topratedshoes.com for more information on how to become an affiliate. Our affiliates program provides commission rates from 5-15%! We know the decision to omit phone support is unusual, but after experimenting with different approaches, we’ve found that starting with email enables us to provide the fastest response. We focus on providing fast and high quality responses by email or live chat, so you’re always talking to a human that can help first-hand. If you are having trouble processing the order with your credit card , we do offer PAYPAL payment options. 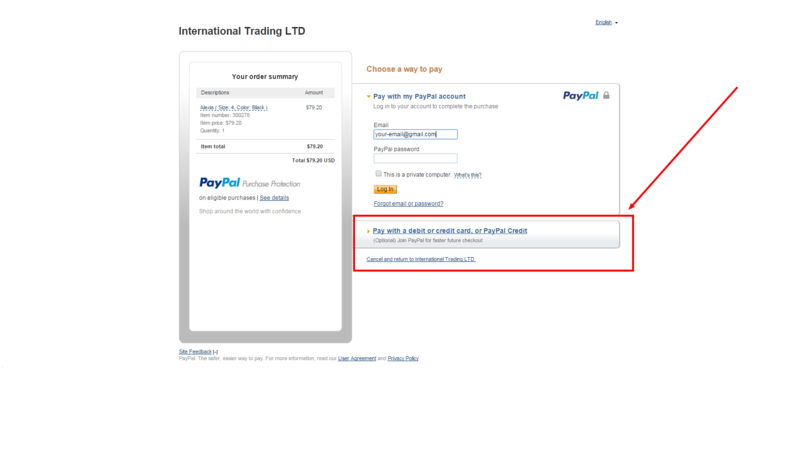 You DO NOT need to have a paypal account to checkout using this method! Simply choose the paypal option, check out, and select “”Pay with a debit or credit card, or Paypal Credit”. Please see below for further clarification.